Mycobacterium chelonae is a rare cause of human infection and is difficult to diagnose unless suspected for the same. A 38-year-old lady, diagnosed to have epigastric hernia, underwent open mesh hernioplasty, after which she developed multiple nonhealing sinuses at site of surgery. The mesh had to be removed and the causative organism was confirmed to be to M. chelonae . Definitive identification of this species of mycobacterium was possible by growth characteristics and biochemical tests. The patient has been on injection amikacin and tab clathromycin, the only two drugs shown to be sensitive to, for the last two months and complete recovery is still awaited. Mycobacterium chelonae is a nontuberculous mycobacterium (NTM), a grouping that encompasses all mycobacteria outside of the Mycobacterium tuberculosis complex. It is classified in the Runyon group IV, rapidly growing mycobacteria. It has been found in natural and processed water sources as well as in sewage. Distribution is likely to be worldwide though exact prevalence and incidence is not known as the World Health Organization does not track NTM infections. Nosocomial skin and soft-tissue disease is rare, but known to be caused by this species. Wound infection with M. chelonae has been reported in two isolated cases of laparoscopic inguinal herniorapphy recently. , We describe one such unusual wound infection following open mesh hernioplasty for incisional hernia and aim to highlight that a high degree of suspicion is required to suspect and detect this organism when faced with chronic wound infection. A 38-year-old apparently healthy lady, diagnosed to have epigastric hernia underwent mesh hernioplasty in June 2005 at our Center. Postoperative recovery was uneventful. However, five weeks later, she presented with multiple discharging sinuses in and around the operative wound. There was associated continuous dull aching pain. No concomitant history of loss of appetite, cough with sputum, fever and weight loss. Examination of the wound revealed mild erythema and induration around the operated site with serosanguinous discharge. With a presumptive diagnosis of delayed wound infection, the patient was empirically treated with Tab Ciprofloxacin (500 mg BD) for seven days and again with Cap Ampiclox (500 mg TDS) for 15 days. Even after a course of this treatment, there was no improvement in local condition and the sinuses persisted, associated with off and on scanty serosanguinous discharge. 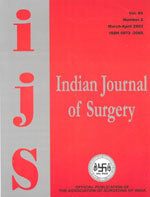 Patient was subjected to investigations to look for the cause of postoperative infection. Blood picture, hepatic and renal function tests were normal. Tests for HIV were negative. Chest X-ray was normal and mantoux test was also negative. Pus was aspirated from the collection beneath one of the sinuses and submitted for culture and sensitivity. Assuming that the mesh was the source of this deep seated, it was removed along with local resection of skin and subcutaneous tissue encompassing sinus-bearing area in Aug 2005 at our center. However, postoperatively the sinuses have persisted [Figure - 1]. In meantime, culture on LJ medium displayed rapidly growing mycobacterial colonies, which were subcultured and subjected to standard biochemical test to identify the sub species. Mycobacterium chelonae has been identified as the culprit, sensitive only to amikacin. The patient is presently on Inj Amikacin (750 mg, IM, OD) and Tab Clarithromycin (500 mg, PO, TDS). Prolonged antibiotic therapy is generally required for M. chelonae infections. No standard duration of therapy is reported. Treatment usually lasts for many months and courses that are six months or longer are not unusual. It is recommended to administer drugs long enough to allow for a complete resolution of clinically apparent lesions. How much additional therapy is needed to prevent relapse is unclear. Surgery is generally indicated with extensive disease, abscess formation or where drug therapy is difficult. Removal of foreign bodies such as breast implants, percutaneous catheters, etc., is important or even essential, to recovery. In the present study, the most probable source of infection could be inadequate sterilization process, such as contaminated water being used for washing instruments, over dilution of disinfectant and storage of disinfectant for long time. The other cause could be due to an infected prolene mesh. But in absence of proven culture from any of above, this remains a conjecture. What is perhaps more pertinent is that the surgeon remains aware of the possibility of infection with NTM and suspect it so in cases of chronic wound infection.